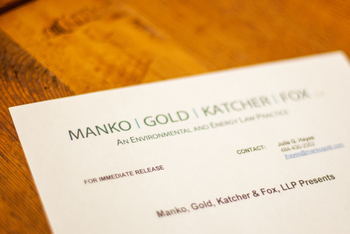 Manko, Gold, Katcher & Fox, LLP, the environmental, energy and land use law firm based in Bala Cynwyd, PA, and several MGKF attorneys have been recognized in their field once again by Chambers and Partners USA 2013: America's Leading Lawyers for Business (“Chambers USA”)*. The firm itself has been ranked by Chambers USA in the top tier for environmental law every year since the first law firm rankings began in 2004. Eight attorneys have been individually ranked. The attorneys who were recognized this year for their work in environmental law include: Joseph M. Manko, Marc E. Gold, Michael M. Meloy, Robert D. Fox, John F. Gullace, Bart E. Cassidy, Jonathan H. Spergel, and Carol F. McCabe. Attorneys Manko, Gold and Cassidy have been included in the rankings since the initial 2003 Chambers edition.